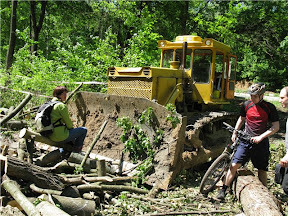 In English | "Зеленый Фронт"
Green Front is a social movement that sprang up spontaneously in Kharkiv on May 20th 2010, when the unlawful felling of the trees commenced in the Gorky Park. At first there were only two people who protested, then seven, later they became twenty. By the time of the butchery in the park on the early morning of June 2th 2010, when the encampment of proesters was demolished and when trees were sawn down right along with the activists on their top, about 200 tree defenders were present in the encampment simultaneously. Now the Green Front proceeds with the fight against illegal felling in the urban bounds: judically, through numerous pickets and other activities, initialization of public hearings and referendums concerning the green lungs of our city. 4. Punish the guilty in the outrageous acts of violence against the park defenders. See original in Russian. docs: En, Ru. June 4th 2010: Gorky Park, the background. A concise actual report on the defence of Kharkiv Gorky Park on May 19 – June 2, with brief introduction to the background (Read more…). 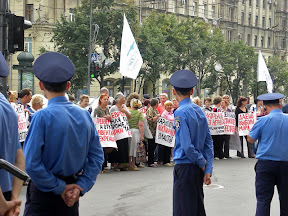 June 7th 2010: Kharkov citizens against municipal authority and police,. docs: En, Ukr (original); source: press-release #512 of Pechenigy ecogroup of July 01th 2010. The first letter to Mr. Platini, President of the UEFA, sent by individuals in the middle of May 2010, concerning the beginning of deforestation of Kharkov Gorky park under the pretext of preparations for Euro 2012: English, Russian, source. “Awarding the Guilty, Punishing the Innocent?”, the article by E. Zakharov, co-head of KhPG, on the felling in the Gorky Park, violations of human rights, falsification by the authorities of the public hearing concerning the green spaces of Kharkiv conducted on June 19th. Published in the weekly newspaper “Zerkalo Nedeli” #26, 10–16 July 2010: in Russian, in Ukrainian. Letter to Mr. Mevlut CAVUSOGLU and officials of the Committee on the Environment, Agriculture and Local and Regional Affairs, concerning the Europe prize 2010, on behalf of various organizations and individuals, July 2010. Original is here (in Ukrainian). (see also the Green Front press-release «The Road of Death» of July 4th). See also the partner project «Gorky Park Chronology». CNN iReport project «FreeUkraine», with videos of the camp demolition of June 2nd and a piece on the falsification by the city authorities of the public hearing regarding the green spaces of Kharkiv.